Home Lifestyle	Do you shop Consignment Sales? 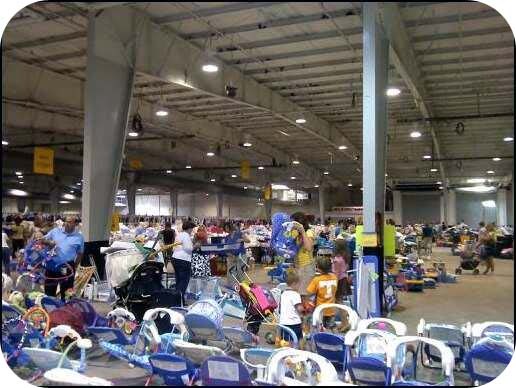 Twice a year there is an enormous consignment sale at the State Fairgrounds. And when I say enormous, I mean people come by the thousands to buy and sell. It is altogether ordinary to see someone bring their own shopping cart, wagon, stroller with no baby, laundry basket on wheels or rolling garment rack to tote around their goods. Raleigh’s Kid’s Exchange is going on right now and this is my first year as a seller! That doesn’t mean much to you, but for me it meant I got to shop a day before the sale opens to the general public. Wee! But don’t worry, there is PLENTY left. sorry for the poor quality of this pic – took it with my phone! In fact, I might just go back on Sunday, which is the last day of the sale and everything is half-price! Be forewarned though, these sales are not for the weak. I suggest leaving your children at home if at ALL possible, bring something on wheels to lug around your loot and make sure you have time to spend at least 2 hours. The line is always long so you should know that 30 minutes in line is considered fast. That said, there are deals to be had! 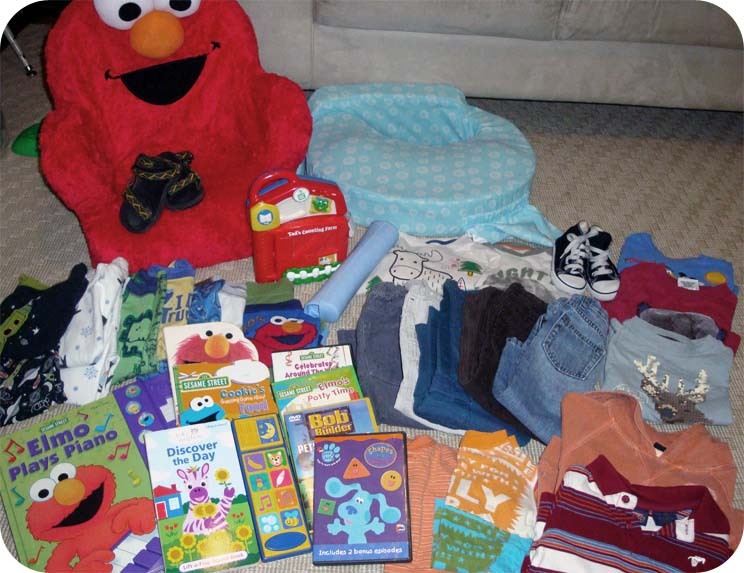 I stocked up on Oscar’s fall/winter wardrobe (5 pants, 6 longsleeve shirts, one tshirt, one l/s onesie, 1 sweatshirt, 6 pjs, and 2 shoes), some books and DVDs, a fun Elmo Chair, a new nursing pillow for me and some other random items all for $92.93. Not a bad morning’s work if you ask me! Check out our haul below. Have you gone yet? How did you do? I would love to see your loot! Send me a pic and I’ll post it on the blog. And for those in Raleigh, the sale opens to the general public today (7/16)! We must have all been running around like a bunch of nut jobs. I bet I could have passed you while I was digging through toys/clothes and never even noticed because I couldn't tear my eyes off of all the goodies!! Looks like you got a great find! Great job! Looks like you did well. Does that sale have bar-coded tags? Yes they do have barcodes. Makes checkout as painless as possible. Even after an hour wait!